Indianapolis Colts quarterback Andrew Luck brought his team to an improbable comeback in last Saturday’s American Football Conference wild-card game, as they won a close 45-44 against the Kansas City Chiefs. Fans believe that even Luck even played way better than Peyton Manning. The crowd was rough in Indianapolis’ Lucas Oil Stadium, as the Colts were down 38-10 in favour of the Chiefs in the third-quarter. The Colts suddenly surged to the second biggest comeback in the history of National Football League playoff. The biggest comeback in NFL history was when Buffalo Bills overtook Houston Oilers ago from 32 points down to a 41-38 win in overtime during the AFC wild-card playoffs 21 years ago. Colts coach Chuck Pagano in a jest said he never had a doubt that they were going to win that game. This is definitely one of the wildest games in this playoff. Another very noticeable thing in the game is how Luck grew into a great player as he showcased in this match. Just last year, he was struggling against the Baltimore Ravens, the team that eventually became the Super Bowl Champions. Last Saturday, however, was totally different and was so much better as he shook off three interceptions, which ultimately powered the team’s comeback. He also threw 443 yards as well as four touchdowns. It was amazing how he told T.Y. Hilton to “just run” for the final TD. With less than five minutes left and the Colts still down 44-38, Andrew Luck threw an game defining bullet to Hilton, which lead to their 65-yard score. That was definitely one of the best plays of the game, but that wasn’t even Lucks greatest play in that game. It was 10:21 as the Colts was up against a second-and-goal coming from the 2 with 41-31 favoring the Chiefs. Luck suddenly made a handoff to Donald Brown, who is a product of UConn. However, Chiefs’ Eric Berry was able to jar he ball lose bouncing off to lineman Samson Satele. Luck, who was very attentive, simply scooped it up, and then he dived across the goal line to bring the gap closer. Pagano said, Luck picked up the ball in a way that only he can do. Pagano was really impressed by how Luck retrieved the ball after they lost it in that play, he said, that was just incredible. That sparked the Colts’ momentum until their victory. Andrew Luck is getting charged up. The legendary quarterback brought the team to an epic comeback in their game against the Chiefs. That only shows that everything is possible with him. Colts pass rusher Robert Mathis made the most game-changing plays among all the defensive players in this season. One of his best play was when he sack-fumbled the Chiefs quarterback Alex Smith turned the game around. Luck believes that nothing really change, and that it is important to stop throwing interception and making all those stupid mistakes. Luck did exactly that. Luck leads his team to win the playoff game, that is something Manning was able to do after six long years. He won't be facing Manning in next Saturday’s game though. Colts will face New England Patriots this coming Saturday. Luck will definitely have a face off against Tom Brady. The Colts is confident with Hilton saying they are hot and they are ready for whatever. 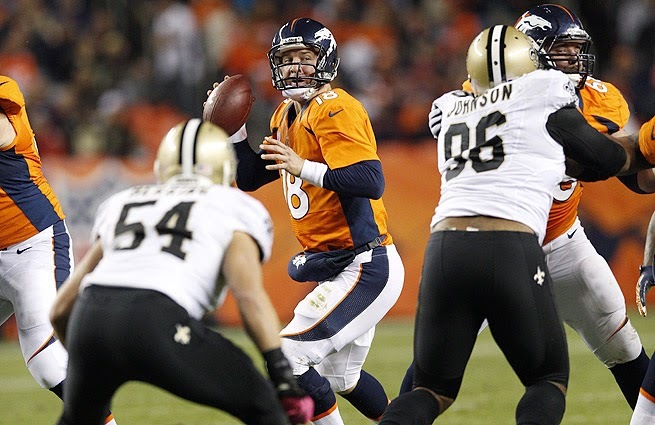 The New Orleans Saints became bullies, which made them win in the playoff game. Saints coach Sean Payton said it was that kind of scrimmage that made the difference between victory and defeat. The Saints conquered the Philadelphia Eagles 26-24 during the Saturday night game. The legendary rushing attack of the Eagles was limited by the Saints to only 80 yards while the Saints made 185 yards as Mark Ingram played the game of his life. Sean Payton said they were consistent in relentlessly pushing the Eagles. Drew Brees noticeably didn’t play in his full potential in that game, but The Saints won none-the-less. The team won with Khiry Robinson plays an exceptional game. Eagles’ tackle Jason Peters and guard Evan Mathis lead the team’s offensive line, which received All-Pro and Pro Bowl Honors during 2013. However, the Saints were able to push them around in last Saturday night’s game despite all their achievements. One defining game-winning field goal made the Saints win against Eagles. Though, it looked like a close game, the Saints were more superior to the Eagles. If “Assistant Coach of the Year” was true, Saints defensive coordinator Rob Ryan should get it. Despite losing Keenan Lewis and Parys Haralson, they were still able to hold the Eagles down to only 256 yards, which is one of Eagles lowest yardage. Saints defensive end Akiem Hicks can be considered as the unsung hero of the game who made the team’s defense possible even without Jabari Greer and Kenny Vaccaro. Nick Foles held the ball and threw it a lot of times, but he made his worst game during the last part of the match. One of the notable things in last Saturday’s game is that the Eagles must have defensive players who can win one-on-one match ups. The offense also needs more weapons, but Eagles’ base is already great. Sean Payton said it was a great team win, but the score could have been a lot bigger. He said they tackled well and they were able to pursue the ball, which he believes is very important. He said, they were able to control the defensive and the offensive lines of the scrimmage, which gave them a big chance of winning. Tight end Benjamin Watson said, their victory was great for both the city and the team. It gives them momentum as they move forward through the playoff and perhaps the Super Bowl. He said winning in the regular season of the league is tough, but winning under harsh conditions, in the cold Philadelphia, give confidence to the team.